USA Today doing "fake history"
With much discussion of "fake news," it is interesting to note that USA Today is re-writing history. either, being hired out to perform work on behalf of his owner. that by living in free states/territories he had become free. lawsuit at all. That presumably would have applied to a suit brought on behalf of the daughter. 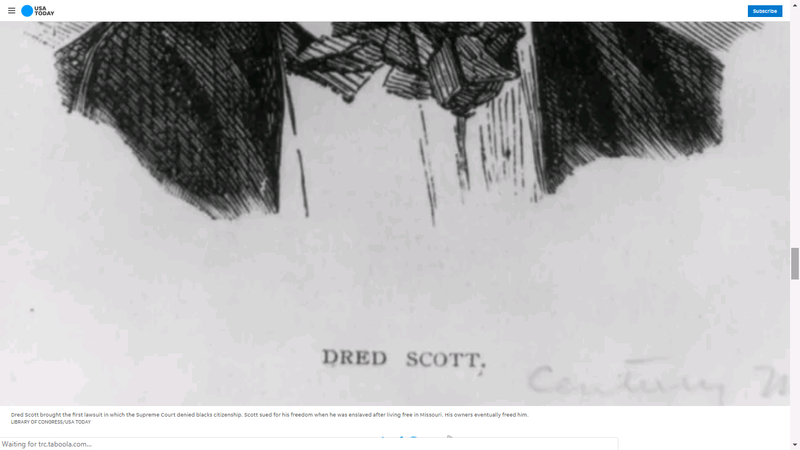 it was Taylor Blow who freed the Scott family. 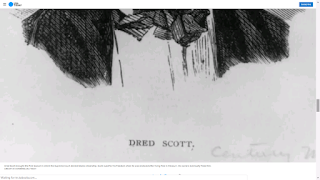 Dred Scott died in 1858, having lived "free" for about 18 months. (1) U.S. Patent No. 6,444,110 (“Barstad”) in view of U.S.
(J.A. 429–35) in view of Alling and the BASF Catalog. teach each limitation of the Challenged Claims. Br. 27; Appellee’s Br. 1–2. is not in [paragraph] 69.”). Barstad col. 1 ll. 24–25. copolymer acting as a surfactant-type suppressor agent. such a finding would be highly relevant to obviousness. dosage—480 mg—of fumaric acid esters (fumarates). Appellee Biogen MA, Inc. (Biogen) owns U.S. Patent No. discloses controlled release compositions of fumarates. fumarates per day, we affirm. Jolley, 308 F.3d 1317, 1320 (Fed. Cir. 2002). contain a written description of the invention.” 35 U.S.C. or plan for obtaining the claimed invention” is not enough. 1341, 1348 (Fed. Cir. 2011). like the one in Forward’s ’871 application. thus see no reason to disturb the Board’s finding. as a basis for other multiple dependent claims, and so on. a further limitation of the subject matter claimed. But the appellants lost in those cases because they were not able to show binding precedential support for their suppositions as to what was required during examination. The Federal Circuit's Berkheimer decision, however, provides more definite precedential support for the content of the Berkheimer memo than Enfish does for the May 2016 Enfish memo. For instance, Berkheimer states in no uncertain terms that "The mere fact that something is disclosed in a piece of prior art, for example, does not mean it was well-understood, routine, and conventional." 881 F.3d at 1369. As such, applicants may have more success in asking the Board to uphold the procedural requirements imposed on examiners by the Berkheimer memo, at Alice step two, than they have had in trying to enforce the July 2015 and May 2016 guidance memos, relating to step one of the Alice framework. The problematic nature of Berkheimer resides in the issue that what was "well-understood, routine, and conventional" at some point in the past is a matter of opinion, not one of fact. What was disclosed in a piece of prior art is a matter of historical fact. A separate issue, raised in the CCIA brief and elsewhere, is that those of skill in the art do not tend to memorialize those things which are "well-understood, routine, and conventional." An actionable claim under 42 USC § 1983 requires: (1) a violation of a right provided under the U.S. Constitution or federal law (2) resulting from a state sanctioned act. Some 1983 plaintiffs allege violations of both their substantive and procedural due process rights under the Fourteenth Amendment. These are distinct species of 1983 claims. A plaintiff seeking relief under § 1983 for a violation of procedural due process must demonstrate that "(1) he was deprived of an individual interest that is encompassed within the Fourteenth Amendment's protection of 'life, liberty, or property,' and (2) the procedures available to him did not provide 'due process of law.'" Hill v. Borough of Kutztown, 455 F.3d 225, 233-34 (3d Cir. 2006). Due process usually requires at least "the opportunity to be heard 'at a meaningful time and in a meaningful manner.'" Mathews v. Eldridge, 424 U.S. 319, 333, 96 S. Ct. 893, 47 L. Ed. 2d 18 (1976) (quoting Armstrong v. Manzo, 380 U.S. 545, 552, 85 S. Ct. 1187, 14 L. Ed. 2d 62 (1965)). The taking of a constitutionally protected property interest without a hearing is nearly a per se violation of procedural due process. Within the Third Circuit, a cognizable substantive due process claim may require deprivation of a protected interest by executive action "so ill-conceived or malicious that it shocks the conscience." When a plaintiff specifically invokes PROCEDURAL due process, one might assume procedural due process is the species of claim intended. of private property by the States as though it incorporated the text of the Fifth Amendment's Takings Clause. See, e. g., Keystone Bituminous Coal Assn. v. DeBenedictis, 480 U.S. 470, 481, n. 10, 94 L. Ed. 2d 472, 107 S. Ct. 1232 (1987). against state action that involved the actual physical invasion of private property. See Loretto v. Teleprompter Manhattan CATV Corp., 458 U.S. 419, 427-433, 73 L. Ed. 2d 868, 102 S. Ct. 3164 (1982); Kaiser Aetna v. United States, 444 U.S. at 178-180.
as appropriating or destroying it." Pennsylvania Coal Co. v. Mahon, 260 U.S. 393, 414, 67 L. Ed. 322, 43 S. Ct. 158 (1922). has an obvious kinship with the line of substantive due process cases that Lochner exemplified. to invalidate state economic regulations that Members of this Court view as unwise or unfair. (quoting City of Sacramento v. Lewis, 523 U.S. 833, 840, 118 S. Ct. 1708, 140 L. Ed. 2d 1043 (1998)). the government's deprivation of that protected interest shocks the conscience.'" Id. (quoting Chainey v. Street, 523 F.3d 200, 219 (3d Cir. 2008)). ""[O]nly the most egregious official conduct' shocks the conscience." Perano v. Twp. of Tilden, 423 F. App'x 234, 238 (3d Cir. 2011) (quoting United Artists Theatre Circuit, Inc., 316 F.3d at 400). "The substantive component of the Due Process Clause 'protects individual liberty against 'certain government actions regardless of the fairness of the procedures used to implement them.'" Gottlieb ex rel. Calabria v. Laurel Highlands Sch. Dist., 272 F.3d 168, 172 (3d Cir. 2001) (quoting Collins v. Harker Heights, 503 U.S. 115, 125, 112 S. Ct. 1061, 117 L. Ed. 2d 261 (1992)). "To establish a substantive due process claim, a plaintiff must prove the particular interest at issue is protected by the substantive due process clause and the government's deprivation of that protected interest shocks the conscience." Chainey v. Street, 523 F.3d 200, 219 (3d Cir. 2008). "[C]onduct intended to injure in some way unjustifiable by any government interest is the sort of official action most likely to rise to the conscience-shocking level." Cty. of Sacramento v. Lewis, 523 U.S. 833, 849, 118 S. Ct. 1708, 140 L. Ed. 2d 1043 (1998). First, with respect to the nature of Frompovicz's property interest, "[t]he United States Court of Appeals for the Third Circuit has recognized that ownership interests in property are interests protected by the substantive aspect of due process." See M & M Stone Co. v. Pennsylvania, Dep't of Envtl. Prot., No. CIV.A. 07-CV-04784, 2008 U.S. Dist. LEXIS 76050, 2008 WL 4467176, at *21 (E.D. Pa. Sept. 29, 2008) (citing Indep. Enterprises Inc. v. Pittsburgh Water & Sewer Auth., 103 F.3d 1165, 1179 n.12 (3d Cir. 1997)). Moreover, "[t]he Third Circuit has explicitly held that cases involving 'zoning decisions, building permits, or other governmental permission required for some intended use of land owned by the plaintiffs . . . implicat[e] the "fundamental" property interest in the ownership of land.'" Id. (quoting Indep. Enterprises, 103 F.3d at 1179 n.12); see DeBlasio v. Zoning Bd. of Adjustment for Twp. of W. Amwell, 53 F.3d 592, 601 (3d Cir. 1995), abrogated on other grounds by UA Theatre Circuit, Inc. v. Twp. of Warrington, 316 F.3d 392 (3d Cir. 2003) (recognizing that a substantive due process right is implicated where a "government decision . . . impinges upon a landowner's use and enjoyment of property"). Here, Frompovicz alleges that Defendants interfered with his use of a DEP operations permit that allowed Frompovicz to "remove and resell spring water for the bottled water industry" from his property in Auburn, Pennsylvania. Compl. ¶¶ 1, 31. The Court finds that Frompovicz's interest in the permit is protected by substantive due process because this interest concerns the use and enjoyment of his real property. See M & M Stone, 2008 U.S. Dist. LEXIS 76050, 2008 WL 4467176, at *22 ("Plaintiff's mining license implicates plaintiff's fundamental property interest in the use, control and enjoyment [*15] of its real property."). Second, the Court must consider whether Frompovicz has alleged conduct on the part of Defendants that both impinges on his protected property right and "shocks the conscience." Frompovicz's Complaint is replete with allegations of "conscience-shocking" conduct on the part of Defendants, but many of these allegations concern alleged conduct that occurred before June 2015 (which Frompovicz admits is irrelevant to his claims) or concern Defendants' alleged failure to enforce DEP regulations with respect to Frompovicz's competitor, MCR. This latter conduct—regardless of whether it was "conscience shocking"—did not impinge on Frompovicz's use and enjoyment of his land. At most, this alleged conduct reduced the value of Frompovicz's operations permit by providing his competitor with an allegedly unfair advantage. But "a decline in property value, by itself, cannot support a substantive due process claim." Kriss v. Fayette Cty., 827 F. Supp. 2d 477, 493 (W.D. Pa. 2011), aff'd, 504 F. App'x 182 (3d Cir. 2012). Accordingly, to the extent Frompovicz seeks to assert a substantive due process claim on the basis of Defendants' alleged conduct vis-à-vis MCR, he fails to state a claim. But Frompovicz's allegations that Defendants have prevented him from removing and [*16] selling his own water—for example, by unjustifiably refusing to finalize the "Corrections Completed Notice"—allege conduct that impinges on the use and enjoyment of his land. Accordingly, these allegations may support a substantive due process claim. Finally, Frompovicz has alleged that Defendants refused to finalize the Corrections Completed Notice, among other thing, in an effort to "silence and destroy" him and to benefit MCR. See Compl. ¶ 193. He has therefore alleged "conscience-shocking" conduct on the part of Defendants, that is, "conduct intended to injure in some way unjustifiable by any government interest." Procedural due process is a different entity. must establish that the state procedure for challenging the deprivation does not satisfy the requirements of procedural due process. Midnight Sessions, Ltd. v. City of Philadelphia, 945 F.2d 667, 680 (3d Cir. 1991) (citation omitted). when it provides reasonable remedies to rectify a legal error by a local administrative body. Bello, 840 F.2d at 1128 (citations omitted). In other words, when a state "affords a full judicial mechanism with which to challenge the administrative decision"
whether or not the plaintiff avails him or herself of the provided appeal mechanism. Midnight Sessions, 945 F.2d at 682. Flash forward to October 19, 2018, and an episode of the CBS Show "Hawaii Five-0" also had a plot line involving theft of sand. [ season 9 episode 4 “A’ohe kio pohaku nalo i ke alo pali (On the Slope of the Cliff, Not One Jutting Rock is Hidden From Sight),” ] With an inside Sherlockian reference to "the game's afoot," one suspects this plot line similarity was quite intentional. The Five-0 episode got more mileage out of the sand theme, with McGarrett improbably jumping into a big sand mixer after a suspect, risking life and limb. The "bad guy" in both CBS shows was improbable. For Elementary, a meek but highly corrupt county official. For Five-0, a cheating husband, who hired a killer off the internet [Craigslist ?] for $2000, which killer killed the wrong [but same named] person first, which mistaken first killing cracked the case. There was a second plot line involving Jerry and Junior. Sadly, this included Jerry uttering a completely false statement of history that the Bell P-59 Airacomet was the first jet fighter. Several problems here. The P-59 was basically copied from the British Gloster E.28/39. The P-59 was technically impractical and ultimately scrapped, never flying in combat. One should review the story of Adolf Galland and the Me-262. industry as a pioneering technological breakthrough. The idea of compulsory licensing of patents in the health context? The Impact of World War I on Present Day Patent Issues, Int. Prop. Today p. 35 (Feb. 2005). Section 1498 was used to negotiate lower drug prices in the 1960s and '70s, but has since faded. In 2001, during the nation's anthrax scare, the Department of Health and Human Services threatened to invoke it to procure more of the antibiotic used to treat the deadly bacterial disease, according to contemporaneous reports. Last year, Louisiana's health secretary unsuccessfully tried to use it to ease the toll pricey hepatitis C medications exerted on the state's Medicaid program.NIH Director Francis Collins remains skeptical, repeatedly saying that a drug's price doesn't constitute a health or safety concern within the agency's jurisdiction.HHS Secretary Alex Azar, speaking at a June Senate hearing, described march-in, also known as "compulsory licensing," as a "socialist" approach. including asserted ethics issues of delaying market entry of a drug with superior safety profiles. One thing that was not disputed in the Senate hearings on Judge Kavanaugh was that, as a young man, Kavanaugh enjoyed beer. Separately, one issue related to Kavanaugh which did not "take off" seemed to be the role of Monica McLean, a high school classmate of Ford's and a graduate of the University of Baltimore School of Law. under 35 U.S.C. § 103, we affirm. & Development Co., v. Mylan Pharmaceuticals Inc., Nos. Cases, No. 14-1171-GMS, 2017 WL 401943, at *14 (D. Del. patents, but the study began two years earlier. J.A. days in a week on which to test frequency. See id. at *19.
patients inject differ depending on the week. Id. the claimed 40mg GA 3x/week dosing regimen obvious. claim elements, rather than the invention as a whole. 676 F.3d 1063 (Fed. Cir. 2012). 853 F.2d 894, 903 (Fed. Cir. 1988)). a limited number of discrete permutations. efficacy while not affecting adverse reactions. v. Apotex, Inc., 550 F.3d 1075, 1086 (Fed. Cir. Footnote 14 gets into "needle fatigue"
676 F.3d at 1063, does not warrant a different outcome. obvious-to-try analysis employed by the district court. drugs, such as those at issue in Cyclobenzaprine. J.A. one dose every two weeks. J.A. 4848–49; 4884–85; 4732.
studies “would be of limited value.” J.A. 20689. Is invocation of "common sense" camouflage for conclusory assertions? “common sense” in its reliance on Dr. Green’s testimony. Plagiarism at speech at the World Medical Association (WMA)? about charges leveled against Dr. Leonid Eidelman, the newly installed president of the WMA. Case No.3:18-cv-491, in the United States District Court for the Western District of North Carolina. patent are patent-ineligible within the meaning of § 101.
conditions and requirements of this title.” 35 U.S.C. Int’l, 134 S. Ct. 2347, 2354 (2014) (collecting cases). subject matter and are therefore invalid under 35 U.S.C. Patents”) are directed to patent-eligible subject matter. claim 12 fail to recite an inventive concept. Id. problems in computers and prior art electronic spreadsheets. pleadings and the patents attached to DET’s complaint. constitute public records. See Hockerson-Halberstadt, Inc.
v. Avia Group Int’l, Inc., 222 F.3d 951, 957 (Fed. Cir. relied on in DET’s opposition to Google’s Rule 12(c) motion. examples of organizing information using tabs. anyone has ever used tabs to organize information. by the inventors because it is easily identified by users. The American Chemical Society (and Elsevier) filed suit in the federal District Court of Maryland on 2 October 2018 asserting copyright infringement by the German entity ResearchGate. The complaint is available on the internet. There are a variety of issues. As a condition of publishing, the American Chemical Society ["ACS"] requires authors to execute an assignment of copyright. Sometimes, authors will modify the agreement to allow use for "advertising" the authors or the institutions of the authors. Sometimes, authors, who do not modify, are not fully aware of the restrictions imposed by the standard ACS form. ResearchGate apparently gets some of its copies from websites into which authors have posted copies of their articles. Either the final printed version or the final peer-reviewed manuscript is acceptable for deposit. NSF’s Public Access Policy applies to awards, funded in whole or in part, as a result of proposals submitted, or due, on or after January 25, 2016. NSF’s Public Access Policy may be viewed at: http://www.nsf.gov/news/special_reports/public_access/index.jsp. In context, Nally is complaining about posting of scientists' final, peer-reviewed articles on an internet website (pubmedcentral) within 12 months AFTER publication in the journal. I could not help thinking about Dan Hunter's article, Walled Gardens, 62 Wash & Lee L. Rev. 607, which complained about the requirement of some law reviews that articles which had been pre-published on an internet website to be removed from the website BEFORE publication in the journal. The common theme is the perceived undesirability, by the journals, of information being made available on the internet. The noncommon theme is the timing. The SCIENCE journals have the expectation of presenting the information FIRST, and worry about the impact of later publication. The LAW journals do not care that the information has been presented somewhere else first, but don't want someone to access the information (presented elsewhere first) AFTER they decide to publish it LATER. American Chemical Society suing Google over google scholar? pursuant to 28 U.S.C. § 1295(a)(4)(A). We affirm. fourth through the first applications in its fifth application. NAI appealed the examiner’s decision to the Board. of the fourth through the first applications. See J.A. 16.
limits the scope of waiver to only the instant application. of waiving a benefit claim in a particular application. to downstream applications. See, e.g., Hagenbuch v.
Sonrai Sys., 2015 U.S. Dist. LEXIS 39083, *10–13 (N.D.
terms it extends to continuing applications . . . .”). application, within the meaning of the law.” Godfrey v.
for the reasons argued by Frito-Lay. omitted). Cross-Appellant Frito-Lay North America, Inc.
descriptive without having acquired distinctiveness. for the reasons asserted by Frito-Lay. Back in 2007, IPBiz discussed California's anti-SLAPP law in the context of the Cha/Flamm plagiarism matter. See Judge to hear anti-SLAPP arguments in Cha/Flamm matter on Nov. 20 . Anti-Slapp issues arose in the context of actress Olivia de Havilland's fight against her false depiction in a docudrama. FX tried to have the lawsuit tossed last summer, on the grounds of California’s anti-Slapp (Strategic Lawsuit Against Public Participation) statute, designed to quickly set aside lawsuits that may be designed to chill free speech. But a trial judge surprised legal observers by ruling that Ms. de Havilland had sufficient grounds to proceed with her lawsuit. Although de Havilland won on the anti-SLAPP issue, she lost at the California appellate level. One would assume de Havilland would point out that a false statement is not history. Having suffered a number of legal setbacks and defeats since filing her lawsuit in June 2017, — including the California Supreme Court’s decision in July not to review her case — de Havilland is seeking to have the nation’s highest court re-examine what jurisdictions in the Golden State have decided.